Here at Village Veterinary Clinic, we use the HomeAgain microchip. This can be done in just a few minutes and we also register your pet for you. HomeAgain will instantly send an email alert to shelters, vet clinics and PetRescuers within the HomeAgain network in the surrounding area where your pet was lost. 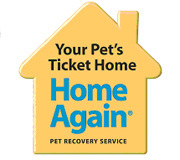 HomeAgain offers on-call support by trained counselors to assist in your pet's recovery. HomeAgain will provide you with a tool to create a "lost pet poster" with your pet's picture so you can begin the search for your pet. HomeAgain offers the immediate engagement of a vast network of PetRescuers to actively look for your pet if he or she should become lost. HomeAgain has a 24/7 network of veterinarians to help you by phone in the case of a medical emergency. HomeAgain offers complimentary Lost Pet Insurance that covers your lost pet for up to $3,000 of emergency medical treatment.